I know it can be stressful picking the images from your wedding or boudoir session that you're going to display throughout your home or put into an album. The task seems daunting--how are you supposed to pick just a hundred of your favorite images from the best day of your life to grace the pages of your wedding album? What if you pick the "wrong" image from your boudoir session for your bedroom wall art and it doesn't elicit the reaction you were hoping for? When looking through your images for the first time after your session, let the first run-through be just for your enjoyment. Relive that day, and let joy and happy surprise wash over you. The second time you look through them, start picking out your favorites. You don't have to have a reason why you like this first batch; set them aside for further review. On the third run through, start picking the final images that you will choose from to design your album or wall art arrangements. When looking at this batch, it often helps to lay out images from the same time of day or from a similar pose side-by-side. Once you have them laid-out, look at each image and ask the following questions: Do you feel an emotional connection to the image? Is your eye repeatedly drawn to the image for artistic reasons? Do you feel beautiful in the image? Does the image document a memento or a special person? If the answer is yes to any of those questions, it's probably a keeper. Remember that if you're working with me, you already have digital copies of all of the images you're looking through. Now you're picking the best of the best to be made into a tangible object that you'll look at for years to come. When selecting images for a wedding album, I recommend the following breakdown of images: 25% getting ready photos, 10-20% ceremony photos, 30-40% First Look/Bride and Groom portraits with bridal party and family photos mixed in, and 25% reception photos. This will give a beautiful blend of the highlights of the day, as well as showcase you and your new husband's relationship by putting an emphasis on the photos of you two. 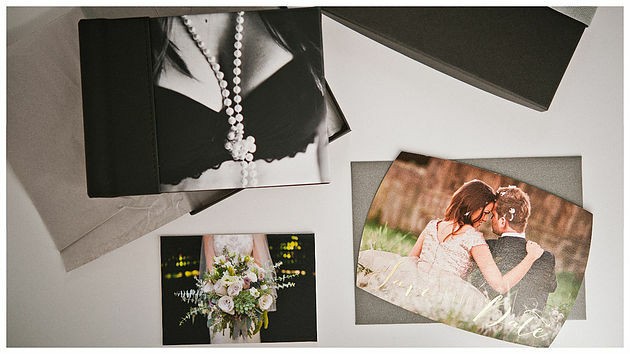 When choosing images for a boudoir album, I would suggest choosing a blend of different poses and outfits. During a KLEM Studios boudoir session, my ladies typically bring 3-4 outfits and we do a number of poses in each outfit. I would suggest equal proportions of each outfit, choosing different poses within each outfit. If some of the poses overlap between the outfits, that's perfectly okay because the different outfits will be something new for your significant other to feast their eyes on! When deciding on images for wall art pieces, we want to be a little more selective as we typically don't display as many images from a session on our walls as we do in an album. Choose a handful of images that you feel completely resonate with who you are as an individual or a couple, images that are visually stunning, and images that you will be happy to look upon for years to come. Whether you work with KLEM Studios or a different photographer, they should be able to seamlessly guide you through the selection process and give their professional input when needed. Have further questions about the image selection process? Shoot me an email, I've got your back!